It's time!! 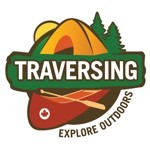 Traversing's 2018 Canoeing Photo Contest has launched and we're looking for your best photo of the year! The contest runs until November 30th and the winners can choose from a $100 e-gift card from Valhalla Pure Outfitters Online, an entire set of Unlostify maps, or an autographed copy of The Happy Camper's latest book. Enter today and share with your friends! It's not really a photo contest. It's a random draw from among submitted photos.